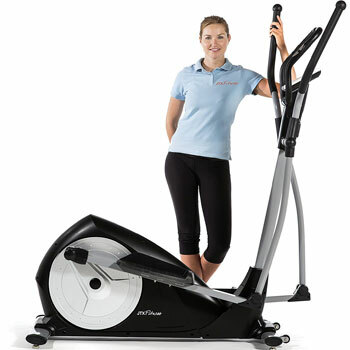 It can be difficult choosing the best type of exercise equipment for a home gym. 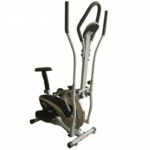 Some people like the motions of the exercise bike, while others like the workout offered by a cross trainer. 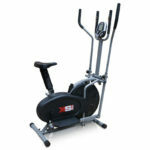 Those that can’t decide, and are short on space, can turn to a 2-in-1 cross trainer bike instead. A well designed dual-purpose model can diversify a weekly regime. 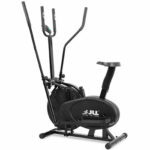 There are some key features to look out for when choosing between these top rated 2-in-1 elliptical trainer bikes. The first is obviously the workout options. There has to be a good balance between both forms of exercise, with enough programmes and resistance settings to suit all users. Then there is the shape and design. These 2-in-1 models are meant to be space-savers, but also need to be comfortable with the right stride lengths and height. From there, look at additional bonuses like pulse sensors or entertainment features. 5 of the best 2-in-1 cross trainer bikes around right now. This XS Sports Pro 2-in1 Elliptical Cross Trainer Exercise Bike offers a compact, yet well thought-out design. It should take up no more than a 91 x 51cm footprint and has transportation wheels to help users move it around. Even so, all the right components are on-board, with the large footplates, moving stride bars and a decent sized seat. Some may worry about the stability of a compact machine like this, but the designers have place the flywheel at the front for better weight distribution. There is also a weight capacity of 110kg and a strong steel frame. Users can work through a series of resistance settings that are said to aid both novice and more experienced users. 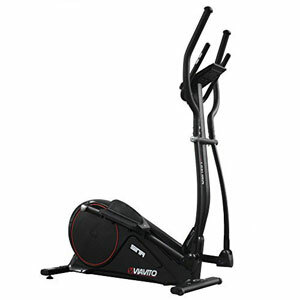 There is also the addition of the reverse movement and pulse sensors to help users push their workout a little further. All data appears on a basic console for a quick indication of the impact of the workout. This good looking model does a great job at providing many of the standard features that new users are looking for. The bike element is comfortable and adaptable with the seat that moves vertically and horizontally. The Viavito Setry 2-in-1 Elliptical Trainer and Exercise Bike has a decent 5kg flywheel and stride length. Across the two disciplines, users can enjoy a series of 20 programmes and 32 levels of resistance. This should help to improve the diversity of the machine even further. Oversized footplates and a smooth motion should add to the comfort and enjoyment of users. Up to 4 users can enjoy this machine thanks to the personalised user profiles. This means couples and older children, or perhaps flatmates in shared houses. They can workout at the level they choose and save settings as they work on personal fitness plans. Their data, including that from the hand pulse sensors, appears on a back-lit display. JLL try to market their CT100 2-in-1 cross trainer/exercise bike as something for all ages. What this really means is that it is accessible enough that novice youngsters and retirees can have a go with ease. They have also made the machine secure, with the steel frame and extra-wide pedals, and comfortable. The seat adjusts five ways for the best possible riding position. Those using this in the home will also appreciate the light weight of that frame, as well as the transportation wheels. This makes it easy to wheel this machine into place. Users can choose where they work out, and also which muscles to workout. 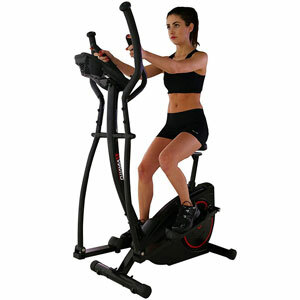 There is a multi-level resistance system that isn’t as high as other top rated 2-in-1 elliptical bikes. Still, it should offer enough progression for those getting back into fitness. The dual-purpose stride bars help too. Some manufacturers take the idea of adaptability in these 2-in-1 machines to another level. 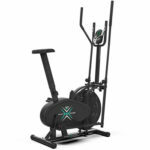 This Fitnessform P1100 2-in-1 Fitness Elliptical Exercise Bike has the usual adjustments with the dual-purpose arms and seat height. However, it is also possible to remove the seat post and console column entirely. This means that users really can transform this machine from one discipline to another. This is comfortable elliptical trainer, with the footplates and difference resistance levels. Then, when the seat goes back on, it is a low impact exercise bike. There is also the console that provides information on the speed, time, distance and more. These options should mean that it is even easier for users to get precisely what they want from this machine. It is too easy to feel as though there is a compromise with the shape of some dual-purpose machines. Here users get the best of both worlds. This means a greater focus on goals each day. The design of these machines often isn’t as important as the shape and motion. It is better to have a basic looking bike that gets the job done than something sleek, wobbly and lacking in resistance. This model from We R Sports doesn’t really stand out from the crowd, as nearly everything about it is black and bulky. Yet, it has the specification that many first-time users are after. There is an average flywheel, 8 levels of magnetic resistance and a series of motions to target different muscle groups. Those that want to push themselves can turn the knob all the way, put the trainer in reverse and try for a new personal best. The console provides data on a user’s performance, as well as pulse reading from the hand grip sensors. The large seat and transport wheels are nice extras. 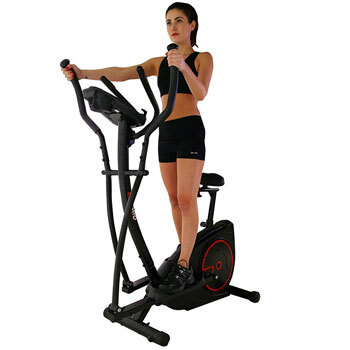 Choosing the best of these top rated 2-in-1 cross trainer bikes for your home. 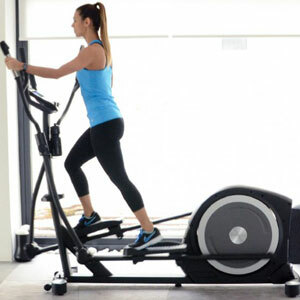 The best choice in dual-purpose machine depends on your fitness goals. Those looking for something for a little mobility and basic toning can focus on the lower-end models with space-saving designs. A small footprint, strong frame and transport wheels all help. Those that need more intensity can look for those reverse motions, moving stride bars and pulse sensors. Compare the specifications to see how far each model can take you. If it is challenging enough, suits the space and is comfortable, it should be a good fit.